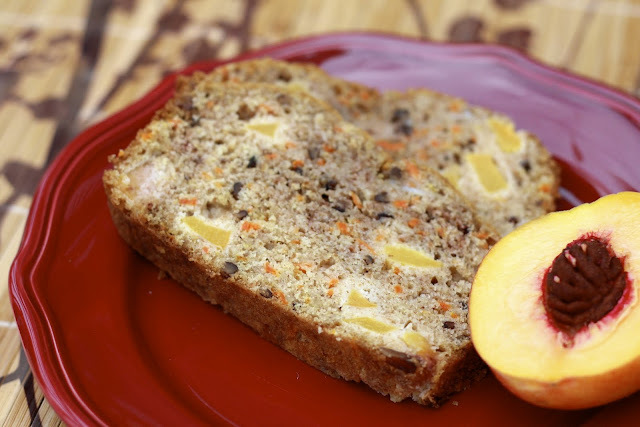 Peaches and carrots aren’t two foods I would normally combine, but I couldn’t resist trying a new quick bread recipe. I’m so glad I didn’t let the seemingly weird pairing spotted in Southern Living magazine scare me away because this bread blew me away! I brought it to church one week I was responsible for post-service refreshments, but not before stealing a slice or two for myself. This bread combines the spices of fall with the produce of summer and I could not get enough of it! Make it now while peaches are still in season! Then again, I’m sure you could also substitute apples for the peaches and make it later this fall. The texture might be slightly different but you’ll still get chunks of fruit amongst the crunchy nuts and soft bread. Any time I can mix fruits and vegetables in something decadent-tasting, I’m all for it. After making this and letting it cool, I froze it until I was ready to serve it. After thawing, I preferred it cold from the fridge. The chunks of peaches were particularly chilly and provided a nice contrast to the rest of the bread. This is one I’ll be making again and again! 1. Preheat oven to 350F. Bake pecans in a single layer on a baking sheet for 5-7 minutes or until toasted and fragrant, stirring halfway through. Cool for 15 minutes. 2. In a large bowl, stir together flours, sugar, cinnamon, baking soda, baking powder, salt, and nutmeg. Stir in peaches, followed by carrots, oil, milk, and eggs. Mix just until moistened and fold in pecans. 3. Spoon batter into a lightly greased 9 x 5 inch loaf pan. 4. Bake at 350F for 55-65 minutes, until an inserted toothpick comes out clean. Cool in pan on a wire rack for 5 minutes before removing from pan and cooling completely on wire rack. This content was originally posted on Honest Cooking in my featured column "Cooking the Magazines".